The art of textile art seems to come naturally to Wendy Ann Stanger, but having spent time watching her create several pieces, I could see that it is not art that just happens. It takes time and patience, an eye for spacial patterning and a huge amount of skill and knowledge. In the hands of the an unskilled person, the various florals, fibres and paste that Wendy uses in her work, would just become a big pulpy mess. With Wendy’s experience though, these fairly basic individual items become gorgeous works of art to have in your home. Using dried flowers and natural fibres, Wendy Ann makes textiles pieces that become wall canvases, decorative artworks and even lampshades. Some are embroidered to enhance their detailing and every piece is bespoke and handmade, which is the beauty of so much of the work you can purchase at Farfield Mill. The materials for Wendy’s work come from various sources. She forages and dyes her own fibres and dries the flowers she uses. Often she is given wedding bouquets and commissioned to create pieces of wall art from them. 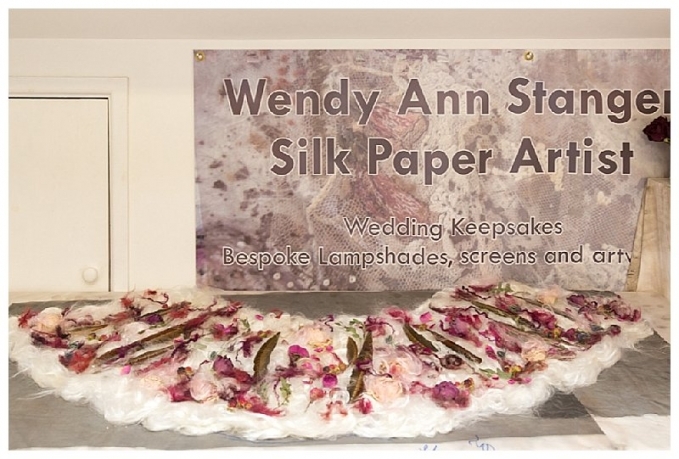 When I was with Wendy in her studio space, she was creating a piece of textile art from wedding flowers that was going to be made in to a lampshade for the couple’s home. What an incredible way to keep a memory from your wedding day. 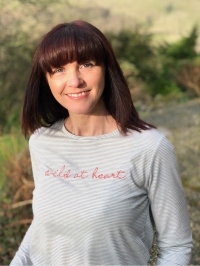 Of course you can find the textile art of Wendy Ann Stanger online, but there is nothing like seeing the pieces up close in her very own creative space at Farfield Mill.